As many of you know, January '09 was a major milestone for the forums at the official club website, Astromech.net. Since January '09, the forums had outpaced the original yahoo! 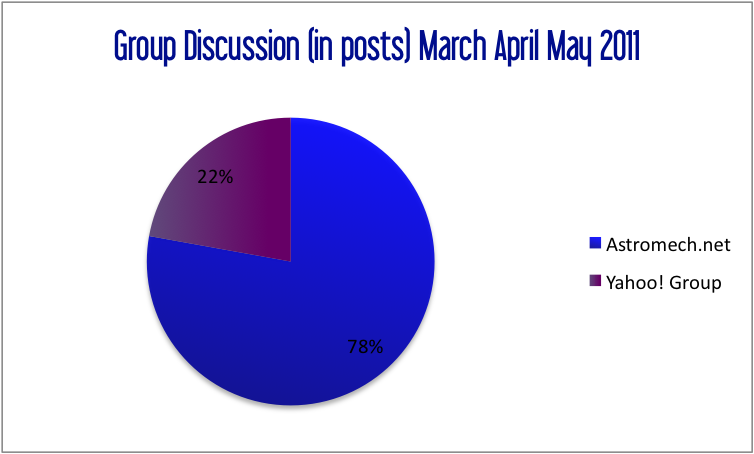 group in posts by a significant margin. This calendar year though, the amount of discussion has skyrocketed, leaving the email list in the dust. Recall that in February, Astromech.net servers were moved by the hosting company, leaving us without the forum for half a month. Since coming back online, the Astromech.net forums have accounted for 78% of the R2 Builders Club discussion. I've said it before but it's worth repeating: if you aren't reading the forums, you are missing more than you are seeing by a wide margin. This doesn't surprise me AT ALL. While I use both of course, the forum is just more suited to what we are doing. I also think the forum is more personable.